Indian Casinos - In the late 1990's many Indian casinos in California were open to age 18 and over. However, times change. Most Southern California Indian Casinos have changed their age limit to 21 years or older. Some casinos are open to age 18 and over. Some casinos will allow people under 18/21 to enter selected portions of the buildings. This policy varies by casino and might be restricted to certain operating hours of the day. Other Indian Casinos enforce an age limit throughout the facility. Card Casinos - Card Clubs are limited to card games and you must be 21 years of age or older. Alcohol - Must be 21 years of age or older to drink alcohol in California therefore the casino bars and many lounges are restricted to 21. Most Indian Casinos in Southern California are open 24 hours. The casinos can get particularly busy on the weekends (late afternoons and evenings) as well as holidays when both the locals and the tourists decide to visit the casinos. Congress adopted the Indian Gaming Regulatory Act (IGRA) (P.L. 100-497, 102 Stat. 2475), signed on 17 Oct 1988. The Act established a complex system to authorize and regulate the gaming and gambling enterprises of American Indian Tribes. On 25 Feb 1987 the US Supreme Court handed down its decision in California vs. Cabazon Band of Mission Indians. Proposition 1A was ratified by the voters of California in March 2000. Approved by more than 64 percent of the voters, the measure amended the California constitutional prohibition against "Nevada style" casinos. California tribal casinos do not reveal their gross income from gambling but some experts say it could be $4 billion a year which approaches the take on the Las Vegas Strip or in Atlantic City. Why 349 slots? That doesn't sound like very many. The California's gambling compacts has a provision that classifies tribes with fewer than 350 machines as non-gaming. This allows them to collect the same funds from a revenue-sharing pool as those with no casinos. The difference between 350 slots and 349 slots can easier be over a million dollars a year. 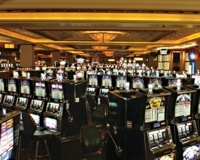 Valley View Casino added 428 machines. Harrah's Rincon Casino added 400 more machines. Licenses were granted Monday 5 October 2009. Those numbers increased each to the maximum of 2,000 slots under deals signed with the state in 1999. Barona Casino and Sycuan Casino already had 2,000 slots each. Pala Casino and Viejas Casino can have an unlimited number of slots and they each have over 2,000. They operate under newer agreements with the state. LOCAL INDIAN CASINOS IN THE NEWS . . .
- Valley View Casino and Hotel reopened on Friday 17 January 2014 after closing down for 11 days in a $6 million remodeling project that included new carpeting, furniture, and artwork. - Pechanga Resort and Casino officially unveiled the multi-million dollar renovation of its 22,000 square foot hotel lobby, two restaurants and two new dining outlets. The project was completed at the end of December 2013. - Harrah's Rincon Casino and Resort is scheduled for a March 2014 opening to their second hotel tower as part of their $160 million expansion project. The new tower will have 403 rooms bringing the total number of rooms at the resort to 1,065. That is the largest number of rooms for any Indian Casino in the San Diego County. - Viejas Casino and Resort opened their $36 million, five story, 128-room hotel and 1,000 vehicle parking garage in 23 March 2013. Opened on 6 April 2001. Open 24 hours. The 45,000 square foot casino features 1,140 slots, 48 gaming tables and bingo. There are six restaurants including the Prime 10 Steakhouse. There is also the Canyons Lounge. 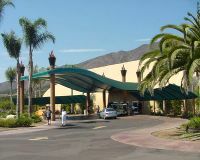 The Agua Caliente tribe became the first and only tribe in California to operate two casinos when it opened the Auga Caliente Casino in April 2001. Final Design - Well, for now at least. As of 17 April 2006. The 16 story 344 room hotel is scheduled for a Fall 2007 opening. Groundbreaking for the $185 million hotel was on Monday 17 April 2006. The entrance to face Bob Hope Drive. The hotel will be managed by the tribe instead of a hotel operator. 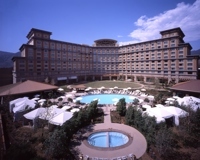 The hotel opened on 18 April 2008 with 340 rooms. The entertainment venue "The Show" opened 12 February 2009 and seats 2,028. The Agua Caliente Casino features a 71,000 sq. ft. casino. Class III slots, table games, 18 table poker room. The hotel features 340 rooms including 314 deluxe guestrooms, 24 executive suites and 2 Presidential Suites. The entertainment venue "The Show" seats 2,028. - The Steakhouse - steak, veal, chicken, prime rib, lobster. - Grand Palms Buffet - buffet. - The Poker Deli - sandwiches. - Waters Cafe - American cuisine patio dining overlooking the pool. - Java Caliente - coffee and pastries. - Wet Bar - poolside bar and grill. Daily shuttle service is available to and from downtown Palm Springs and area resorts. off the San Bernardino (I-10) Freeway near Rancho Mirage at the intersection of Bob Hope Drive and Ramon Road. Opened July 2002. Owned and runned by the Augustine Band of Mission Indians. Open 24 hours. Casino is a small boutique casino with 32,000 square feet including 804 slots, Video porker, and table games. There is a restaurant, coffee and snack bar. No alcoholic beverages. Must be 21 or over to enter casino. - Cafe 54 - open 24 hours. - Menyikish Bar & Grill - Hot dogs to shrimp cocktails. 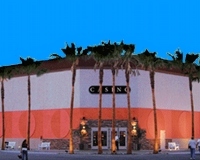 Augustine Casino is located off Interstate 10 in Coachella. From the west take Jefferson Street exit south to Avenue 54. Turn left on to Avenue 54. Continue straight ahead and Augustine Casino is on the right. From the east take Dillion Road exit south. Dillion Road bends right on to Avenue 48. Turn left from Avenue 48 on to Van Buren Street. Take Van Buren Street south to Avenue 54. Turn left on to Avenue 54 and Augustine Casino is on the right. The Barona Band of Mission Indians located in San Diego County. The Barona Band of Mission Indians officially opened the $260 million Barona Valley Ranch Resort and Casino in January 2003. 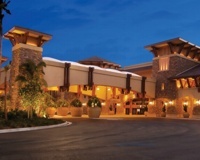 The Barona Valley Ranch Resort and Casino features a 397 room luxury hotel including 33 suites. There is a 3000,000 sq. ft. casino with 2,000 slot machines, 59 gaming tables, a poker room, and an off-track betting parlor. Open 24 hours. Casino age limit is 18 and over. No alcohol is allowed on the casino floor. Drinking and making the return drive on Wildcat Canyon Road at the end of a long night in the casino just do not mix. Alcohol is available with the hotel's room service. The Barona Oaks Steakhouse located right off the casino floor does serve alcoholic beverages as well as the Italian Cucina, the Plaza, and in the El Rancho Grande. If this is important to you, call Barona to verify the latest rules. Guests must be 21 years of age to reserve a hotel room. Steakhouse - steaks, prime rib, chicken. dinner evenings. Italian Cucina - pizza, calzone, pasta, short ribs. Sage Cafe - 24 hour. El Rancho Grande - Mexican cuisine. Ho Wan Noodle Shop - "Good Luck" noodles. open daily. If you have not been there before make sure that you take directions with you. You will need them. See Barona map. It is not easy to find. After turning off of Highway 67, following Willow road and then Wildcat Canyon Road through through the hills, you arrive at the Indian Reservation. Then the large open pasture land on the left reveals a large Casino surrounded by a huge parking lot. A short road takes you to the entrance. The Casino itself is big. Located approximately 30 minutes northeast of San Diego. Just east of Poway and south of Ramona. From the Airport. Leave the San Diego airport traveling east on Harbor Drive. Turn left on Laurel Avenue. Make another left onto I-5 traveling north. From I-5 exit I-8 east. Follow I-8 east and exit Highway 67 north. Follow 67 north. Yes it turns from a freeway into s surface highway with stoplights. Right onto Willow Road. (I think it was the second stop light). You are on smaller roads now. Turn left onto Wildcat Canyon Road. Follow Wildcat Canyon Road for approximately 5 miles. Barona Casino will be on the left and is well marked. From Los Angeles and North San Diego. Travel south on I-5. From I-5 exit I-8 east. Follow I-8 east and exit Highway 67 north. Follow 67 north. Yes it turns from a freeway into s surface highway with stoplights. Right onto Willow Road. (I think it was the second stop light). You are on smaller roads now. Turn left onto Wildcat Canyon Road. Follow Wildcat Canyon Road for approximately 5 miles. Barona Casino will be on the left and is well marked. Age 21 and over. Open 24 hours. Las Vegas Style Slots and Blackjack in an intimate gaming location situated on a knoll just off the highway overlooking the valley. The casino is 14,000 square feet with 302 slots. There are 3 tables. Dining includes a Sunday Brunch. The close proximity of the restaurant, full bar and dance floor with stage in the back of the casino makes for nice evening entertainment. From the Palm Springs Desert Area - Take the Highway 111 to State Route 74 South and head up into the hills. State Route 74 will merge into Highway 371 in Anza. Stay to the right. From Desert: approximately 30 min. From Riverside/San Diego/Temecula/Los Angeles - Take Interstate 15 to Highway 79 South in Temecula. Stay on Highway 79 for 18 miles and then turn left on to State Route 371 toward Indio. Minutes from Temecula, about a half hour from Riverside. One hour from San Diego. The first tent like structure was built in 1994. Age 18 and over. The Chumash Casino offers 73,000 square feet of gaming open 24 hours with over 2,000 slots and video games. Table games, video gaming machines, Bingo and food and beverage. Separate Poker room to the right as you walk in the front entrance. Food is cafe/snack bar style in the back of the casino. Note: As of March 2003, Chumash Casino was applying for a liquor license to serve wine in an upscale steakhouse that it plans to add to the growing casino where a new casino and an adjaacent hotel are in the works. In Santa Ynez just three miles east of Solvang. That's about 30 minutes north of Santa Barbara California. Between Santa Barbara and Santa Maria. From Highway 101 take the Highway 246 exit at Buellton. Follow Highway 246 east through Solvang and continue to Santa Inez. Chumash Casino is on the right. Appoximately six miles from where you left Highway 101. Cuyapaipe Band of Mission Indians / Ewiiaapaayp Band of Kumeyaay Indians. The Band plans to build a casino on the front six acres of the proposed Little Cuyapaipe Reservation. Plans call for 1,000 slot machines. Located in the Laguna Mountains in San Diego County roughly 12 mile north of Campo. Commercial development is not feasible on the Cuyapaipe Indian Reservation and additional land is planned for use. Additional land is located in Alpine. 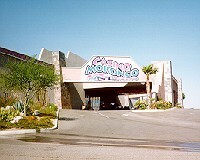 The Cabazon Band was the first Native American tribe in the U.S. to have gaming on its reservation. 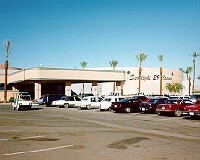 The U.S. Supreme Court's 1987 Cabazon Decision paved the way for other tribes to operate gaming centers. In late 1980, the Cabazon Band opened their casino but it was forced to shut down a few weeks later. They operated under a temporary injunction as a card room while the courts decided their case. Open 21 Dec 2004 - $200 million addition to Fantasy Springs Resort Casino: a 12 story, 250 room hotel and 100,000 square foot special events center. The 120 foot hotel is the tallest manmade structure in Coachella Valley. On the top of the hotel is the Sunset View rooftop bar. The hotel features 10 suites and 240 standard guest rooms. The events center can accommodate up to 4,500 guests and the kitchen can serve up to 2,000 guests. Also new for 2004, the tribe opened a 15,000 square foot high tech bingo facility which seats 750 people. Starbucks opens 2005 under a license to the Cabazon Band. The 18 hole Fantasy Springs Eagle Falls Golf Course opened in 2007. The Joy Asian restaurant opened 9 November 2010. Open 24 hours per day, 7 days a week. There are 2,000 slots, 40 table games, Bingo, restaurants, an Off-Track Betting room, sports events, entertainment, and an 18 hole Eagle Falls Golf Course. 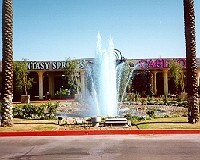 The Fantasy Springs Casino in a 265,000 square foot gaming and entertainment venue. Weekly bands in the LIT lounge. Name entertainment. The Seasonal Rock Yard features tribute bands, Improv comedy club, and 24 lane bowling center. There is also a Gift Shop. The hotel has 250 rooms and lounging by the 103-foot swimming pool. The Rock Yard Outdoor Concert Stage is open seasonally until the early fall. The Special Events Center seats 3,500. Smoking is permitted inside the casino except for designated non-smoking areas. For gambling, you must be 21 and over. Age 21 and over to attend the Improv and 12th Floor Wine Bar. Age 18 and over for the outdoor Rock Yard. No age limit for shows inside the Special Events Center; however, minors must be accompanied by an adult. Age 21 and over to make a hotel reservation. Joy Asian Cuisine - Authentic Chinese and modern favorites. Lunch and dinner daily. Lique Ice Cream Parlour - All American burgers, tacos and sandwiches. POM - Traditional California Cuisine with tastes from Latin America and Italy. Breakfast, lunch and dinner. Bistro - Exciting, contemporary fine cuisine. Open for dinner. LIT - Cocktails and small bar bites. Bar and lounge. Fresh Grill Buffet - Carving stations and desert island. Lunch and dinner. Pizza Kitchen - New York Style Pizza and traditional Italian favorites. 12th Floor Wine Bar - Extensive list of fine wines and top shelf spirits. Triple Crown Room - 24 hour coffee shop menu. Bingo Palace - hot dogs, sandwiches, snacks. Fantasy Lanes Family Bowling Center - snacks daily. From Los Angeles take I-10 east. Exit I-10 at Auto Center Drive (that's the Highway 111/86 exit). Left turn at the signal at the end of off ramp to go over the freeway. Turn right on the frontage road and continue for about one half mile. The Campo Band of Kumeyaay Indians located in San Diego County. 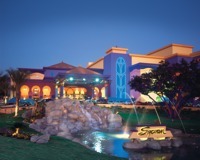 The Golden Acorn Casino had their official opening on 15 August 2001. 24/7 Truck stop and casino. 60,000 square foot facility including 25,000 square feet of gaming space. Table games and over 750 Slots. Auto and truck stop services. Travel Center and convenience store. The casino offers full beverage service. I-8 at Crestwood Exit just 20 minutes east of Alpine California located near Campo, California. Age 21 and over to enter and play in the main casino. In addition to the casino, Havasu Landing also has an air strip, marina, RV Park and campground. 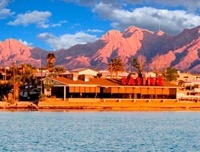 Located on the western shores of Lake Havasu. Jamul Indian Village in San Diego County. The Jamul Indian Village is a tribe of Kumeyaay Indians (Mission Indians). Jamul Band Official Web Site. The Band is planning to build a gaming facility. Jamul Indian Village reports on their website that Lakes Entertainment, Inc. as an agreement for the development and financing of a casino resort operation. The location would be just off I-94 and a short 20 minute drive from downtown San Diego. Lakes Entertainment Reports on their website that the plan is for 1,000 gaming devices, 20 table games and 5 poker tables. Opening estimated to be 2015. 19 March 2012 - The San Diego Union Tribune reports that the the tribe is taking a fresh look at building a casino. Current plans call for a $230 million complex with a three-level casino, wasterwater treatment, fire station, and two large parking structures. The 17,500 square foot casino would have three surface parking lots. The tribe has been meeting with Caltrans to address concerns over the traffic. Information in Environmental Impact posted Wednesday 14 March 2012 on the Jamul Indian Village website. January 2014 - The Jamul Indian Village announced that they have begun construction of the $360 million Hollywood Casino Jamul. The casino is expected to have 2,000 game machines, 50 gaming tables, an events center, five restaurants, and a 1,900 vehicle parking structure. The Jamul Indian Village Reservations sit on approximately six acres of Land and is situated 10 miles southeast of the City of El Cajon in the community of Jamul. La Jolla Band of Luiseño Indians. Opened on 20 May 2002. Closed on August 2004. A minimarket and gas station is at the site. Too much competition from the larger casinos nearby. 30 slot arcade located in an arcade area of The La Jolla Trading Post. Open 8am to 11pm Monday thru Thursday. Open 24 hours weekends. Open 7am Friday to 11pm Sunday. Sengme Oaks Water Park, a water theme amusement park in Northern San Diego County. The Lo Jolla Indian Campground. The Water Park is located off SR 76 and Sengme Oaks Road at the La Jolla Indian Reservation in Pauma Valley. Bingo hall opened in 1983. The present $250 million Morongo Casino Resort expansion opened in 15 November 2004. The new $250 million 44 acre Morongo Casino, Resort and Spa has 2,000 slots, 70 table games and a separate poker room. The official grand opening for the 23 story 310 room hotel was 10 December 2004. Morongo Casino features fine dining restaurants, buffet, 24 hour coffee shop, and nightclub. Open 24 hours a day, 7 days a week. In the summer of 2008, Morongo Casino changed with the times as gas prices were keeping people closer to home and the economy was not what it use be. The resort is now completely managed in-house. The partnership with The Levy Organization ended in mid-June 2008. The Desert Orchid (Asian-fusion restaurant) on the first floor is closed. Look for changes and price adjustments in Cielo (Steak and seafood restaurant on the top floor). Food is more basic now and hotel room rates have been adjusted for the times. The Morongo is actively reaching out to it's nearby, as in 30 miles, neighbors to come and visit. Age Limit - The legal age to gamble at the Morongo casino is 18. The legal age to purchase or consume alcohol is 21. Call Morongo for details if it is important to you. Morongo Casino Resort and Spa is one of the largest casinos in California. -Rooms - 27 story hotel tower with 310 deluxe rooms including 32 suites and six oasis casitas. -Gift Shop - Souvenirs and sundries. -150,000 sq. ft. of gaming. -Private 22 table poker room. Potrero Canyon Buffet - California style salad and pasta bar, Asian cuisine. Brunch on Sundays. Ceilo - Steak and seafood. Located on the 27th floor. Serrano - Contemporary American cuisine open 24 hours. Sunset Bar & Grill - outdoors with seasonal hours. Food Court - Fatburger, Panda Express, LA Italian Kitchen, Haagen Daz, Nathan's (hot dogs). Mystique - Lounge with live music. Pit Bar - located near the heart of the casino by the blackjack tables. Morongo Casino is located 90 minutes east of Los Angeles and 20 miles west of Palm Springs on the north side of the I-10 Freeway east of Beaumont and east of where the 60 and 10 join together. From Los Angeles take the Apache Trail exit north. From he desert take the Main Street exit north to Seminole Drive. The Pala Band of Mission Indians in San Diego County. Opened on 3 April 2001. The complex was built by the Perini Building Company. A $79.5 million expansion contract added a new 10-story hotel tower with 507 rooms, an Olympic-size pool, and a 600-car parking structure. The Casino was expanded, a restaurant was added and the Grand Cabaret 1,000 seat entertainment venue along with the Palomar Starlight Theater (1 2,000 seat outdoor concert venue) were all completed in August 2003. "Infinity" Showroom - The Infinity Showroom opened on 6 May 2011 with a free Gabriel Iglesias After Party. The Infinity Showroom was formerly the Grand Cabaret. Seating for up to 900. It can be an intimate setting for concerts and live shows. It can also be a nightclub and party venue as well as a Sports Experience on select nights. It is designed to be a versatile entertainment venue. The 10,000 square foot room has a high-end delay audio system, 17 giant HD video screens and state-of-the-art concert lighting. Pala Casino, Spa and Resort has 2,000 slots, 15 poker tables, 87 table games, 10 restaurants, 4 entertainment venues, 507 rooms including 82 suites, a 10,000 square foot spa and salon. Open 24 hours per day, 7 days a week. Must be 21 to gamble. Restaurant seating is available to children who are accompanied by an adult. Pala Events Center seats up to 2,000. Starlight Theater, outside open air venue featuring summer concerts on the lawn. 40,000 Square feet of meeting and convention space. Located in northern San Diego County, Pala is just 15 minutes north of Escandido, 12 miles south of Temecula, and 5 miles east of I-15 on SR 76. From the north or south, take the I-15 to the Pala exit (State Route 76). Travel east for five miles and the casino will be on the right (south) side. From Los Angeles / Orange Counties, take the I-5 south to State Route 76, eastbound 23 miles. Multi-level parking garage and valet services are available. The Pauma / Yuima Band of Mission Indians in San Diego County. In planning large Pauma-Foxwoods Resort - to be developed with the Connecticut tribe that owns Foxwoods Resort Casino, a new large-scale gambling resort is in the planning stages. If built as planned, the Pauma-Foxwoods resort would be large with 171,000 square foot casino, 2,500 slot machines, 400 room hotel, health spa, 1,500 seat event center and a 2,500 seat outdoor amphitheater. This $300 million project would replace the 1,090 slot Casino Pauma. As reported 22 January 2007. The Interim casino opened on 15 May 2001 and is tropically themed 65,000 square foot complex offers more than 40,000 square feet of gaming, 1050 state-of-the-art slot machines and 23 table games. There is a poker parlor and a well-ventilated non-smoking section. Dining: Pauma Bay Café, Red Parrot Lounge, Triple 7 Bar. Live entertainment. Open 24 hours. Age 21 and over. Located in northern San Diego County. Exit I-15 at SR-76 (Oceanside/Pala exit) and travel east 12 miles to Pauma Reservations Road. Turn left on Pauma Reservation Road and drive through the orange groves for half a mile. Note that the Pauma Reservation Road is a small road that "T's" in to the highway. Pauma Reservation Road is directly across from Jiberto's Taco Shop. Click above image for larger more detailed image of Pechanga Casino. Wide photo taken April 2013. The Pechanga Casino is in Riverside County just north of the Riverside and San Diego County line. The third phase $262 million "Eagle 3" opened 24 June 2002. The older smaller "Eagle 2" closed at that time. Pechanga Band of Luiseño Indians June 2002 opening makes it the largest Indian gambling complex in the state. There was an 85,000 sq. ft. casino, 1,200 seat showroom, 14 story hotel, and 38,800 convention center, cabaret lounge, Eagle's Nest Lounge at the top of the hotel and seven restaurants. The age limit to gamble was raised from 18 to 21 in 2003. In November 2004, expansion added some gaming area, food court, and a sports-themed restaurant. In August 2008, the 18-hole championship golf course - Journey at Pechanga, was opened to the public. The gold clubhouse was opened in November 2008. In June 2011, the newly remodeled buffet opened. 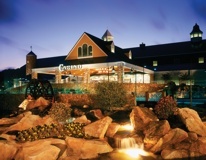 The Pechanga Buffet has undergone a complete remodel and officially re-opened to the public 9 June 2011. September 2011. Bamboo, the new 134-seat Asian restaurant, officially opens to the public on 1 September 2011. The Bamboo asian restaurant will offer an array of authentic Asian noodle dishes. There is no entree per se. It is meant to be fast paced. Open daily 11 am to 3 am. Prices $7 to $15. Noodle dishes include: Pork Pan Fried Noodles, Shrimp Lo Mein, Roasted Duck with Thin Egg Noodles, and Chinese Beef Stew with Ho Fun Noodles. There will also be regional Asian dishes such as Korean Bi Bim Bap and several Vietnamese Pho options. The 5,500 square foot 2 million dollar restaurant is located on the east side of the Pechanga Casino. Fast food for the Asian gaming population. Blazing Noodles, the Pechanga Casino's current Asian restaurant, will continue to serve it's full menu of options including appetizers, entrees and desserts. February 2012. The Pechanga Resort and Casino sets the record for the world's largest slot machine tournament. The event featured a total of 2,885 players and there were three rounds. The free event was open to anyone 21 years of age or older. The top 300 players won $100,000 in cash and EasyPlay. More than 1,100 slot machines (out of the total of over 3,800 slots at Pechanga) from five different manufacturers on the Pechanga floor used Bally Technologies' software to become tournament machines for the event. This allowed the players to compete head to head with 1,100 other players at the same time. Prior to using the Bally Technologies' software, Pechanga's tournament area had 78 dedicated machines and was one of the largest anywhere. The record is for the number of unique slot tournament players in one venue in a 24 hour period. A Guinness World Records adjudicator verified the feat on Saturday, 11 February 2011. October 2013. I stopped by the Pechanga Casino on Monday 28 October 2013. The multimillion dollar remodeling project is progressing nicely. Work began on 3 September 2013. Look forward to a remodeled hotel lobby, restaurants, rooftop nightclub and retail stores. Look for high ceilings, a 'rain curtain,' as well as an overhaul of the 24-hour Pechanga Cafe and Blazing Noodles restaurants. Also look forward to a a renovated Eagle's Nest rooftop nightclub with sweeping views. Estimated reopening of the off limits remodeling effort is by the end of the year.. 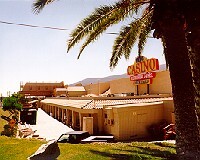 The casino and hotel is open during the remodel. December 21, 2013 Update - Open in time for Christmas 2013. The new lobby, hotel check-in, Pechanga Cafe and Blazing Noodles to open Monday 23 December 2013. Have you stopped by Pechanga lately? Did you see their new Titan 360 Slot Machine by Konami Gaming, Inc.? As if 3,800 machines were not enough already. Yes, it is big - 12 feet tall. Seats eight players in a round configuration with a three-tier bonusing system. It was installed 4 November 2013. First of it's kind in the Western United States. January 2014 - Pechanga Resort and Casino officially unveiled their mult-million dollar renovation of its 20,000 square foot hotel lobby, two restaurants, and two new dining outlets. The project was completed at the end of 2013. Guests can watch two 84-inch 4K Ultra high definition flat panel TV screens when checking in. Other changes include a replacement of the Seafood Grotto, changes to the Blazing Noodles, and changes to the Pechanga Cafe. The Umi Sushi and Oyser Bar is a new restaurant that is located in the space of the former Seafood Grotto. A 10th dining spot just off the lobby will open at the end of January 2014. It will have selections for coffee and wine drinkers. The largest casino in the Western United States. That's right. That even includes Vegas. The casino floor at Pechanga is larger than any casino in Las Vegas. The hotel has 517 rooms. Pechanga Theater Showroom seats 1,200 and has headline acts. Concert tickets available at Box Office. Pechanga also features short run (usually 2 to 3 days) shows. The Journey at Pechanga is a 7,219 yard, Par 72, 18 hole golf course. The RV Resort has 168 sites with full electric, water, cable TV and sewer service. - 188,000 sq. ft. casino floor includes a large non-smoking casino floor area. - 133 table games, 54 tables in the poker room, and a 14,000 sq. ft. high limit area. - Pechanga Theater Showroom with Headliner concerts and shows seats 1,200. - Grand Ballroom hosts championship boxing. - Cabaret lounge and Eagle's Nest lounge with live entertainment. - RV Resort - 168 sites with full electric, water, cable TV and sewer service. - Pechanga Buffet - newly remodeled 9 June 2011. - Bamboo - Asian noodle dishes. Opened 1 September 2011. IMHO The Pechanga Buffet - I had a opportunity to enjoy the Pechanga Buffet for lunch on Thursday 5 April 2012. Great buffet. Huge. Walk the buffet before you start so that you can see the selection. Grilled and BBQ items, American comfort food as well as Mexican and Latin items. They have some seafood (oysters and crab legs) and California roll type sushi along with some Asian items. Salad bar. Good service. The waitress was real nice. I tried some of the prime rib and it was delicious. They had too many deserts but I did try a few of them. Price does vary for lunch, dinner, weekend, or brunch. Also Pechanga Club card members get a discount (no card, Silver, Gold, Platinum, Red). And you can sometimes get discounts through promotions. From the north, take I-15 Freeway south to Temecula. Exit Temecula/Highway 79 south (Indio). Turn left on Highway 79. From highway 79 continue one half mile, turn right at the stoplight on to Pala Road. Continue on Pala for approximately 2 miles. Pechanga is located on the right. From the south, take I-15 north to Temecula. Exit Temecula/Highway 79 south (Indio). Turn right on to Highway 79. From highway 79 continue one half mile, turn right at the stoplight on to Pala Road. Continue on Pala for approximately 2 miles. Pechanga is located on the right. The La Posta Casino opened in January 2007. 2012 - Closed - The La Posta casino closed Sunday 21 October 2012 due to financial problems as a result of a lack of business. The casino employed 60 people when it opened in 2007. Near it's peak, it employed about 100 employees. the 20,000 square foot casino had 349 slot machines and presented bands weekly. - Marie's Restaurant for breakfast, lunch and dinner. Located 65 miles east of San Diego. Take I-8 east for 65 miles. Take the Crestwood Exit and take a left. Drive up the hill. The Tribe completed much of the work on the $214 million Quechan Casino Resort in the Fall of 2008. However, the economy created financing issues which delayed the completion. 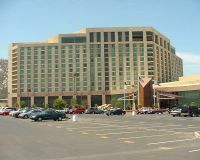 The Quechan Casino Resort opened on 13 February 2009. The 256,000 sq. ft. casino resort features a 30,000 sq. ft. casino with 990 Class III gaming machines, table games, and poker tables. The Pipa Event Center has 22,500 sq. ft with a concert capacity of 2,300 and a banquet capacity of 850. There is also a lazy river for rafting fun. Parking for recreational vehicles. The Quechan Resort hotel features 166 rooms with 8 suites in a five story building. Follow Interstate I-8 to California Exit No 166 - CA SR 186 (Los Algodones Road). Turn south on Los Algodones Road. The Quechan Resort Casino is located on the right hand side. The Rincon San Luiseño Band of Mission Indians is located in San Diego County. Partnered with Harrah's Casino, Rincon Casino is slots paradise. Open daily, 24 hours. New for 2004 - 20 December 2004 Opening Ceremonies for the new 21 story hotel tower and resort addition. The $168 million expansion has 651 rooms including 101 suites and 593,660 square feet. The older Harrah's Rincon had 201 hotel rooms. Also new at Harrah's Rincon is a 7,500 square foot spa with 10 treatment rooms. There is the Cabana Cove, a new poolside restaurant and bar. This new addition is now the tallest building in North County San Diego. 9 August 2012 - The 7-Eleven, Inc. has partnered with Harrah's Rincon Hotel and Casino for their first franchise. The 2,964 square foot 7-Eleven store celebrated it's grand opening 9 August 2012. 30 October 2012 - Harrah's Rincon is scheduled to start construction Thursday 1 November 2012 on a $150 million expansion that includes: new 403 room hotel tower, 2,200 seat entertainment center. The project is expected to take approximately 17 months. At completion, Harrah's Rincon will be the largest American Indian casino resort in California in terms of the number of hotel rooms. The existing tower has 662 rooms. Other items under construction will be an expansion of the pool garden including a "Lazy River" and a swim-up bar. There will be a new indoor/outdoor Mexican restaurant which should be finished as part of the first phase scheduled to be completed by Fall 2013. The new 23,000 square foot convention and entertainment center is scheduled to be completed by the end of 2013. It will accommodate 2,200 concert guests and accommodate 1,000 for a banquet / dinner event. The new hotel tower is anticipated to be completed by spring 2014. There are no plans to expand the casino floor. Under the terms of the new compact, the maximum number of slot machines that the casino can operate is 2,250. Refer to Union Tribune San Diego Article of 30 October 2012. 2014 - Look for a new second hotel tower scheduled to open in March 2014 as part of a $160 million expansion project. The new tower to include 403 rooms. That will bring the Harrah's Rincon Casino and Resort to a total of 1,065 rooms. More hotel rooms than any other casino in the San Diego County. 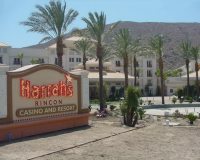 The Rincon Casino and Resort is owned by the Rincon San Luiseno Band of Mission Indians and managed by HCAL, a subsidiary of Harrah's Operating Co. 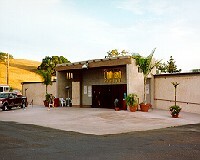 The Santa Ysabel Casino opened in March 2007. It is located on a mountainside overlooking Lake Henshaw. 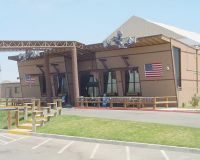 As one of the smallest tribal casinos in San Diego County, the 30,000 sq. ft casino has some card tables, restaurant, and exactly 349 slot machines. 7 August 2012 - The Santa Ysabel Casino seeks bankruptcy protections according to the Tuesday 7 August 2012 Wall Street Journal Article. 3 February 2014 - The Santa Ysabel Casino officially announces the closure of the casino. The Santa Ysabel Casino was the smallest Indian gaming casino in San Diego County with 349 slot machines. The casino had 115 employees. Closed . . . .
Age 21 and over to gamble. There are no smoke-free areas in the casino. The Orchard Restaurant is no smoking. Alcohol is served. - 7 Oaks - bar and lounge. Remotely located approximately 35 miles east of Escondido and 60 miles southeast of Temecula on Highway 79 South. On Highway 79 between Warner Springs and Julian. Owned and Operated by the San Manuel Band of Serrano Mission Indians. Friday 28 January 2005 - Greatly Expanded New Casino opening day draws large crowds. The new casino is 480,000 square feet or about 4 times as much as the building it replaces. 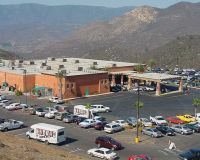 The San Manuel Indian Bingo and Casino is a large complex. Open 24/7. Must be 21 and older to enter casino. No smoking in the poker room but there is smoking in the casino. There is no hotel. The large 120,000 square foot casino has 3,000 slot machines, 130 table games including 3 and 4 card poker, Texas Hold'em, Omaha, Let it Ride, 7 Card Stud, Blackjack, Mini Baccarat, and Pai Gow Poker. There is a high limit room. There is also a 2500 seat bingo. Entertainment in the Yuhaviatam Room includes headliners, martial arts, and boxing. There is also free nightly entertainment in the Tukut Lounge with music, comedy, and dancing. Parking is available in the six-level parking structure. Self parking or valet parking service is available. There is a 425-foot pedestrian bridge connecting the parking structure with the casino. The bridge contains moving walkways. - The Pines - Upscale steakhouse dining evenings Wed through Sunday. - Serrano Buffet - Open daily for lunch and dinner. - Serrano Bakery - Located in the Serrano Buffet. Fresh baked deserts. - SportsWatch® Grill - Burgers, steaks, desserts. - Tutu's Food Court - Fast food in a cafe style setting. Located at the end of Victoria Avenue. From the I-10 Freeway take Junction 30 west. Exit Highland Avenue. Make a right turn. Turn left on to N. Victoria Ave. (the first light). Continue up Victoria. From the I-215 Freeway, take Highway 30 east. Take the second Highland exit. Make a left turn onto Highland. From Highland, make a left turn onto N. Victoria Ave. Continue up Victoria. Age 21 and over to enter the casino. Under age 21 ok in the Steakhouse restaurant. 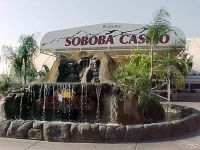 The 74,000 square foot Soboba Casino has 2,000 Video Gaming Machines and slots as well as Bingo and Poker. AC's Lounge has daily entertainment including live bands, DJ and Karaoke. The lounge has three 11x19 foot large screen TV's plus 16 high definition screens. Soboba Steakhouse - open 7 days a week, Sunday Champagne Brunch. Cafe Soboba - open 24 hours for burgers, hot dogs and snacks. Spsy Sushi - Oriental food daily for lunch and dinner. Entertainment Pavilion - seats 15,000 for summer concerts, King of the Cage Events, and live boxing events. Nestled in the foothills of the San Jacinto Mountains east of the 79 Highway. Ramona expressway at Lake park in San Jacinto California. From I-215 Freeway exit 74 Freeway to Hemet. Drive east to Hemet on Highway 74. In the center of Hemet make a left turn on to San Jacinto Street (Highway 79). Continue north a ways on San Jacinto. Right on Main. Continue on Main for approximately 2 miles. Main becomes Lake Park. Right at stop on to Soboba Road. Continue another eight tens of a mile. Soboba Casino is on the right. $95 million Spa Resort Casino opened in 2003. The Spa at the Spa Resort Casino opened in 1960. The property is owned and operated by the Agua Caliente Band of Cahuilla Indians. 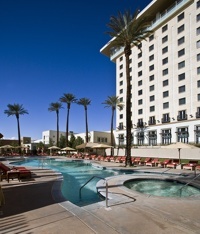 The Spa Resort Casino is centrally located in Palm Springs. It is a half-mile from the Palm Springs Convention Center. Features are its natural hot mineral springs, full-service spa and salon as well as it's casino. The Spa Resort Casino offers deluxe guestrooms and junior suites. Some have pool-facing balconies or mountain views. The Spa Resort Casino features a 24-hour casino with slots and table games along with live entertainment and dining. The Steakhouse - steaks, chops, seafood and wine in an upscale setting. The Noodle Bar - Asian dishes and fresh sushi. Sundance Tequila Bar - Food and a selection of tequilas. Corner Deli - For that quick bite - sandwiches, pizza. Oasis Buffet - Asian, Mexican, Italian, American. There is a nice Sunday Champagne Brunch. The 24 hour casino has over 1,000 slots and video machines, 40 Table Games with high-limit gaming. There is an enclosed non-smoking slot room. Outdoor Entertainment Venue for 2200. The Spa Resort Casino is 2 miles from Palm Springs International Airport. The casino entrance is located on E. Amado Road and Calle Encilia. The hotel entrance is located on the corner of Encilia and Tahquitz Canyon Way. The 29 Palms Band of Mission Indians. The Spotlight 29 Casino is owned and operated by the Twenty-Nine Palms Band of Mission Indians. It opened its doors in 1995. At that time, there was 100,000 square feet of space. In 2001, the Spotlight 29 Casino became the Trump 29 Casino as it was teamed up with Donald Trump. It changed management and the casino returned back to Spotlight 29 in 2006. The new 2,500 seat showroom opened in September 2002. In 2009, the casino underwent major renovations starting with a new parking structure that can accommodate 1,200 vehicles. The remodeled inside includes almost 250,000 square feet for gaming, office space, meeting and conference space, dining and entertainment. The Spotlight 29 Casino has previously hosted a Bingo room. They no longer have the bingo hall. Must be age 21 and over to play. Open 24 hours per day, 7 days per week. The casino has 2,000 slot machines. Table games include Black Jack, Pai Gow and Mini Baccarat. Spotlight 29 Casino also has Mystery Card Roulette. Dining options include a food court that features a McDonald's and a Chava's Mexican Grill. (Coming soon at the time of this writing is a Subway.) Cafe Capitata is a buffet for lunch and dinner. A full menu is also available for breakfast, lunch, and dinner. The JEM Prime 29 Steakhouse features steak, seafood, and pasta where wine is served by the glass. The Spotlight 29 Casino has a state of the art showroom that hosts name celebrity headliners. Located at the intersection of I-10 Freeway and Highway 111. From the Los Angeles area take the I-10 Freeway east past Indio to Coachella Valley. Exit Dillon Road. Take a right. The Sycuan Band of the Kumeyaay Nation is located in San Diego County. Age 18 and over to enter casino, restaurants and theatre. 24 hour casino. Table gaming, video gaming machines (2,000 Slots), Bingo, off-track betting, and gift shop. Bingo seems to be popular. Hosts a variety of live musical entertainment. Approximately 30 minutes from downtown San Diego. Showcase Theater opened in 2002. No alcoholic beverages are served at the Casino. Hotel - The Sycuan Resort features 103 room lodge, 54 holes of golf, 11 lighted tennis courts and conference rooms. Paipa's Oasis Buffet - Asian cuisine. Brunch/lunch and dinner daily. Sunday Brunch. Bingo Snack Bar - burgers, sandwiches, snacks. open daily during bingo hours. Sunset Deli - deli sandwiches, salads, pizza, coffee, ice cream. Cafe and Grille - Omelets, sandwiches and dinner entree. The cafe and grille and patio is adjacent to the golf course. From San Diego take I-8 Freeway east to El Cajon. Exit El Cajon Blvd. Continue on El Cajon Blvd, go two or three blocks (approximately half mile) and make a right on to Washington Blvd. Continue on Washington for about 3 miles. Washington becomes Dehesa Road. Continue winding along Dehesa for about 5 miles. (At about 2 miles you will pass Singing Hills Golf Course on the right. Just continue on Dehesa.) There is a sharp right where Dehesa meets with Harbison Canyon Road. Do not go straight on Harbison Canyon Road. Instead make the right turn and continue on Dehesa Road. There will be a sign posted for Sycuan. Another 0.8 miles (from Harbison Canyon Road) turn right on to Sycuan Road. There will be a sign directing you. Continue along Sycuan Road. Vaket parking is available in the front. Additional self park in the back lot. In the early stages, this casino sits on a 640 acres site along Highway 86. Construction has already started on the travel center and the casino is scheduled to break ground in February 2005. The travel center is scheduled to open 1 May 2005 and the casino is scheduled to open by the end of summer 2005. The casino will have 349 slot machines. The travel center will feature a food court, washers and dryers and a small lounge for truck drivers. The truck drivers will get to park in the rear of the travel center and will have a separate entrance. Open 24 hours. 14,000 square feet with 349 gaming machines, 8 table games. Northwest corner of Imperial County on Highway 86 near Mecca approximately 35 miles southeast of Palm Springs. Valley View Casino opened their new 108-room eight-story hotel on Friday 19 November 2010. The hotel is oriented towards anyone 21 and over. They should get some interest since their casino gets about 2.5 million guests a year. The hotel has 96 deluxe rooms that are 520 square feet each. There are 12 expansive suites of more than 1,000 square feet. Included in the $71 million project is a 5,000 square foot event center, vanishing edge pool, an outdoor breakfast area next to the pool, and a retail shop. Rooms book early for the weekends. The San Pasqual Band of Mission Indians is located in San Diego County. The $40 million Valley View Casino (Phase I) on the San Pasqual Reservation opened on 18 April 2001 with more than 750 slot machines, high-limit blackjack tables and a 24-hour buffet. No entertainment or alcohol. Open 24 hours. Age 21 and over. 40,900 square foot single story gaming facility including 20,160 square feet of gaming area. 17 Jan 2014 - On Friday, 17 January 2014, the Valley View Casino and Hotel reopened after closing for 11 days for a $6 million remodel. The remodeling project included installation of new carpeting and replacement of furniture and artwork. The Valley View Casino features 2,000 slot machines and 26 tables including blackjack, roulette, baccarat, and pai gow poker. The Valley View Hotel features 96 deluxe rooms and 12 luxury suites. Live entertainment at the Main Stage Bar. Age 21 and over for the casino, hotel, and restaurants. The Valley View Casino and Hotel is an adults-only playground. Smoke-free addition to the casino has slots, table games, it's own Players Club, full bar, and rest rooms. - Black&Blue Steakhouse - steak and lounge. - BLD's Cafe - Breakfast, lunch, dinner. - Scoops - gelato, frozen yogurt shop. - Sweets - coffee and pastry shop. - Stix Asian - noodle bar, dim sum, sushi. - Snax - 24 hour snack shop. Located in Northern San Diego County just 12 miles north of Escondido. From the South - Take I-15 North to Via Rancho Parkway in Escondido. Turn right and travel east. Via Rancho will become Bear Valley Parkway. Turn right onto E. Valley Parkway, which becomes Valley Center Rd. Turn right on Lake Wohlford Rd. and travel past the lake (approx. 4 miles). Continue another 3 miles. Valley View Casino will be on the left, just off Nyemii Pass Rd. From the North - Take I-15 south to the Gopher Canyon/Old Castle Rd. exit. Turn left on Gopher Canyon to Champagne Blvd. Turn right on Champagne Blvd. and Left on Old Castle Rd. Old Castle will become Lilac Rd., which ends at Valley Center Rd. Turn Left on Valley Center Rd. and travel approximately 7 miles to North Lake Wohlford Rd. Turn right. Travel about 1 mile. Valley View Casino will be on the right-hand side. The Viejas Band of Kumeyaay Indians is located in San Diego County. September 1991 - The original casino opened on 13 September 1991 with 10,000 square feet of gaming space. It has grown substantially since then. August 2011 - On 31 August 2011, Viejas officially announces plans for a new $26 million 150-room hotel. The hotel could rise as many as seven stories. Plan details are still tentative. The project also includes expansion of seating in the buffet. Bingo games to be moved into the casino. The hotel would be located east of the casino approximately where a large white bingo tent is located now. Ground breaking ceremony expected early in 2012 with completion expected in 2013. Previous plans in 2007 for a 600-room hotel as part of a large overhal was significantly scaled back because of the poor economy. March 2013 - Viejas Casino and Resort on 21 March 2013 in a private ceremony and 23 March 2013 in a public ceremony opened their $36 million, five story, 128-room hotel along with their new 1,000 vehicle parking garage. The hotel is 100 percent smoke free in all areas. Age 18 and over in gamning areas. 21 and over in the DreamCatcher Showroom, the Lounge, and the Mezz bar. Open 24 hours a day, 7 days a week. Poker, Bingo, Double Hand Baccarat, Pai Gow Poker, Super Pan 9, Caribbean Stud, Let It Ride, Blackjack, Slots. Viejas Outlet Center across the street. Outlet open 7 days a week. Saturday nights offer free family entertainment. The $55 million Outlet Center has 57 stores and is the first American Indian owned retail outlet center. The 25 acre open air shopping, dining, and entertainment complex is themed tor reflect a Native American village with waterfalls and streams. Grove Steakhouse - Lunch and dinner daily. Harvest Buffet - buffet for lunch and dinner daily. Sunday brunch. Sunrise Diner - breakfast, lunch, dinener. Hamburgers and blue plate specials. China Camp - Chinese food, lunch and dinner till 2am daily. Mezz Deli - appetizers and sandwiches. Just north of the I-8 Freeway about 30 minutes from downtown San Diego. From San Diego take the I-8 Freeway east. At Alpine, exit Willows Road. Make a left turn to go over the freeway and then right on Willows Road which continues east parallel to the freeway. Continue along Willows Road. The Current Web Page that you are on now is for Indian Casinos of Southern California. If it is important, please contact the casino directly for current information. Concerts - comprehensive Southern California listing. Click above image for more details on the 3D Printed Heart Pendant. Click above image for more details on the 3D Printed Cross Pendant.